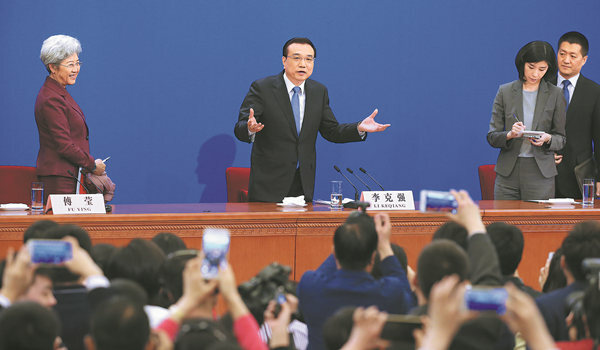 Premier Li's widely-watched press conference also covered domestic issues, particularly, the future of China's economy. Li said there would be no 'hard landing' for the country, and that the government continues to work to provide jobs for millions of people. According to Premier Li Keqiang, rumors of the Chinese economy's demise are greatly exaggerated. "China's economic performance in the past few years should suffice to put predictions of a hard landing to a FULL STOP. The Chinese economy will NOT have a hard landing. We will keep growing at a reasonable growth rate, of better quality too," Premier Li said. The premier says providing good jobs for the people of China will be the government's top priority for 2017. "We're creating 11 million new jobs for urban residents this year. And we'll stick to the 6-point-5 percent growth target as we look to secure these jobs for our people. Employment will be a key. We've been proactive in employment policies in the last few years. It's still our priority this year. We will NOT have mass unemployment. We won't allow this to happen," Premier Li said. This will be a tall task for the government as it seeks to cut overcapacity in several industries. Finding jobs for employees who are displaced will be vital. "We will continue to shed overcapacity, especially in steel and coal production. We deeply care about people who face job transitions. We've allocated 100 billion yuan to help them in this shift. Our solution is simple: find new engines that will drive up growth, provide new jobs and boost traditional sectors," Premier Li said. Li also made other promises. He said taxes and fees on companies will be cut by one trillion yuan. The government will also set up a special fund to study the cause of smog, and cut red tape across all levels of the bureaucracy. He ended the briefing by saying the country's people will have their own part to play. "Through hard work, everyone's lives will be better."